Happy Monday! I hope your weekend was great! Today I’m going to tell you how we framed our bathroom mirrors- because I must have done 5 million (no exaggeration here folks) Google searches in order to figure out how to do our mirrors. 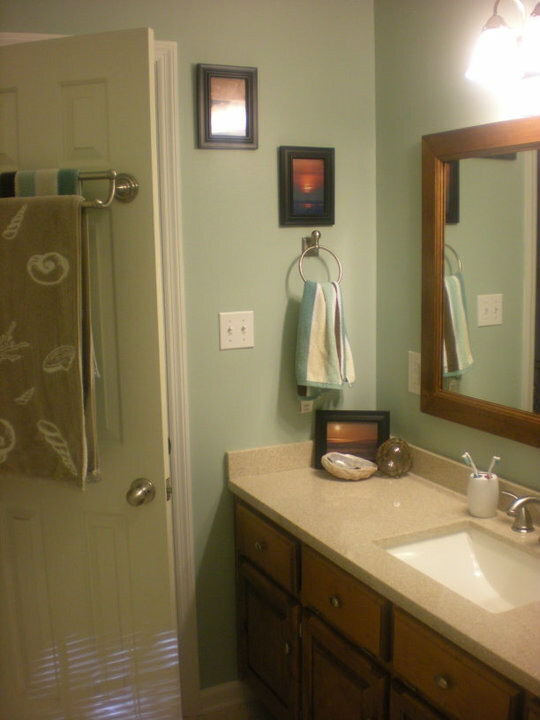 There are SO many different ways to frame mirrors out there, including kits that you can buy. I’m going to add my tutorial to the list- I’m not saying it’s the best, but it was simple and involves very few tools. This way, the frame would conceal the new clips, but not cover up a ton of the mirror’s surface. After settling on this method, we then placed our molding pieces on the mirror and measured the length that each board needed to be on its outside edge (the longest edge). Then we went out and cut each board at a 45 degree angle with the miter box saw. Pine is soft enough to be able to make the cuts with the miter box saw- which is good because we don’t own a miter saw! After making the cuts, we sanded down the edges and the faces of the boards to make them nice and smooth, and then prepped the wood with a wood conditioner. This allows the soft pine wood to better accept the stain. We stained the pieces according to the directions on the stain can (we used a tiny can of Minwax English Chestnut and had enough to do both mirrors, plus some extra). 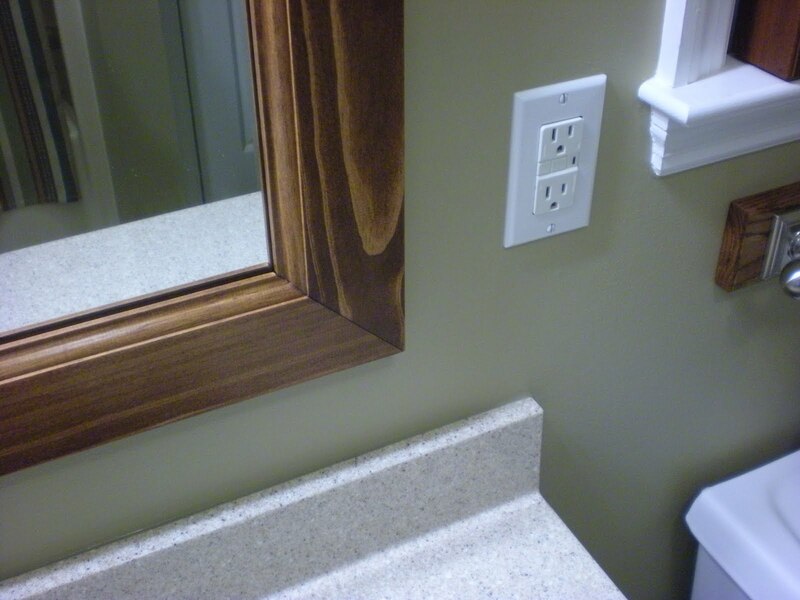 Make sure you stain the back of the wood as well, because you will see a little bit of it in the mirror. After the stain was dry, we applied several thin coats of polyurethane (Minwax fast drying poly in satin). Alternatively, you can get a stain with a poly built in- I used this on our coffee table and it worked great. Or, if you don’t like stain, you can paint the frame. Your choice! 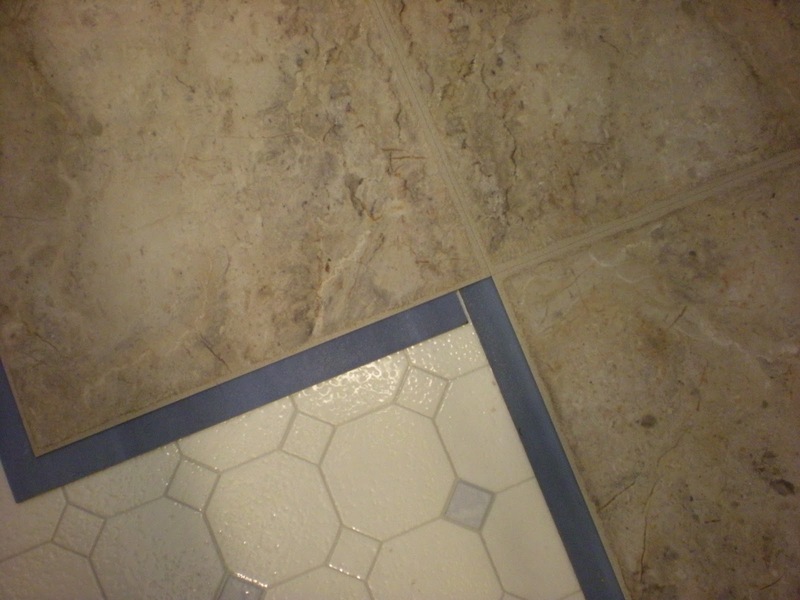 Mitered corners- if you don’t get your miter cuts just right, you can fill in the gap with some wood putty that accepts stain. If you decide to paint your frame, fill in the gap with some paintable caulk or spackle. Ta-da! 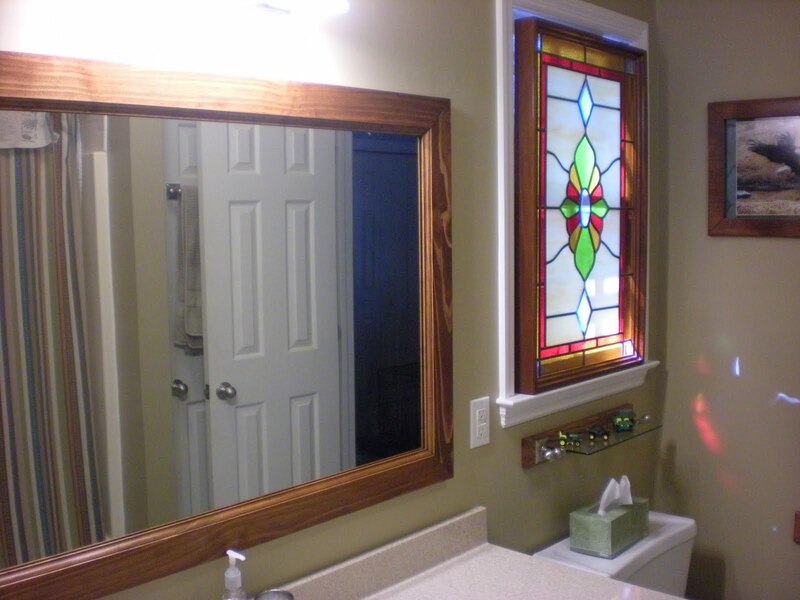 Not too difficult and it dresses up a mirror nicely. Plus, it’s affordable. All in all, we spent around $55 per mirror to get this project done- $20 to have the mirror cut down, about $15 for the molding (our mirrors are about 4ft long x 3ft wide), $20 for the stain and poly and wood conditioner (which we used on both mirrors and still have some leftover), $8 for 2 packs of mirror clips, $5 for mirror adhesive and $8 for the saw kit. If you don’t have to cut your mirror down, you could easily do a large mirror for $35- WAY cheaper than those mirror kits!! Framing the bathroom mirrors has to be one of my favorite projects that we’ve done in the house- a lot of impact for very little effort. I’m back! Betcha didn’t think I’d make it after the weekend!! Ha- maybe I will stick to this blogging thing. So after we bought our house, we spent the next 8 months painting every. single. surface. (I don’t think we did anything have to do with the outside, except stain the fence- and technically that could be considered painting as well!) Some people say that a room in your house won’t feel like your own until you paint it- I can see that. 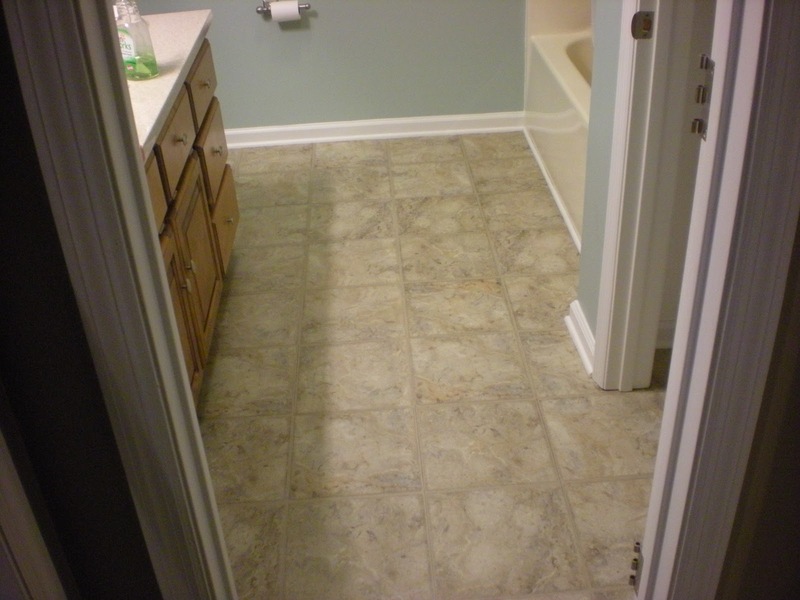 Especially since one of the draws about owning your own home is making it your own space. We had two motivators for painting the rooms soon after moving into our house, aside from making it our own space. 1. The people who lived there before were TERRIBLE painters. I have a sneaking suspicion they painted right before they put it on the market, because that paint was slapped up on those walls. Example: our bedroom was tan except part of one wall (not the whole wall) got left blue- why?? 2. We didn’t want to move furniture into a room until the room got painted, because we didn’t want to be playing furniture shuffle. 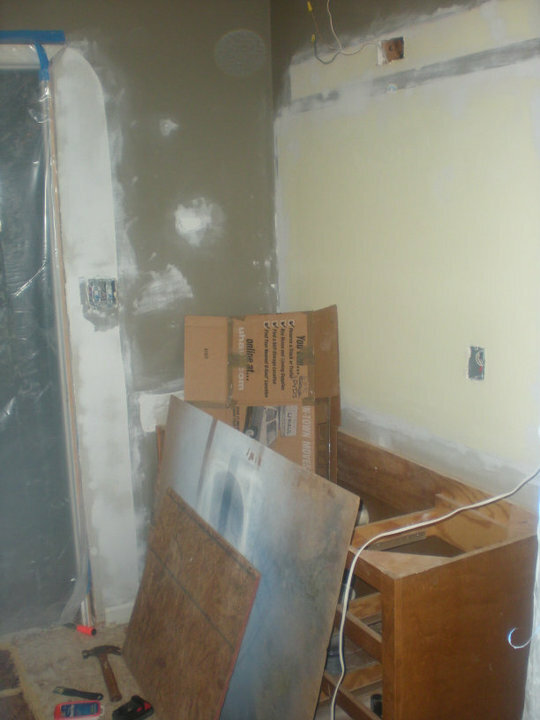 So our bedroom was the first to be painted, then the kitchen, then the living room, etc etc. See- not too bad. 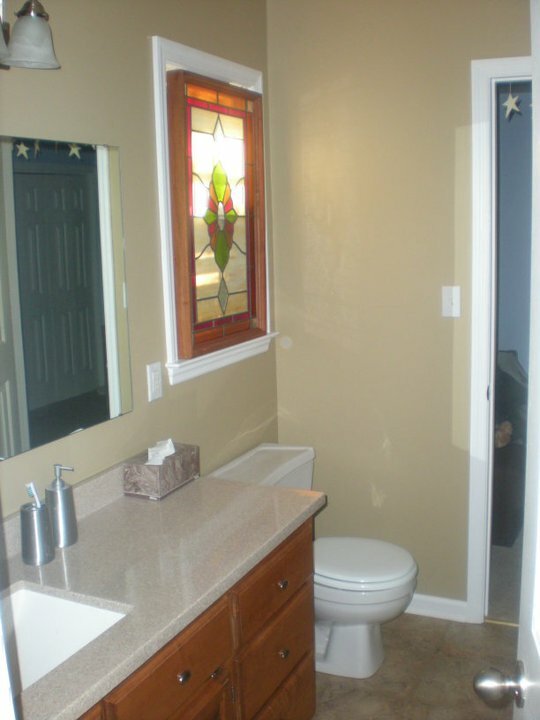 What you don’t fully see is the slapped on paint that’s too dark for the space, the white laminate counter top that is separating from the plywood and the giant mirror/light fixture that’s straight from the 80’s. Wasn’t this supposed to be a simple paint job?? So my husband cut out a piece of the sub-floor (FYI- never done this before- another great thing about owning your own house, you learn on the job!) and replaced it with a new piece of plywood. What you don’t see pictures of is the 3 days (!!) 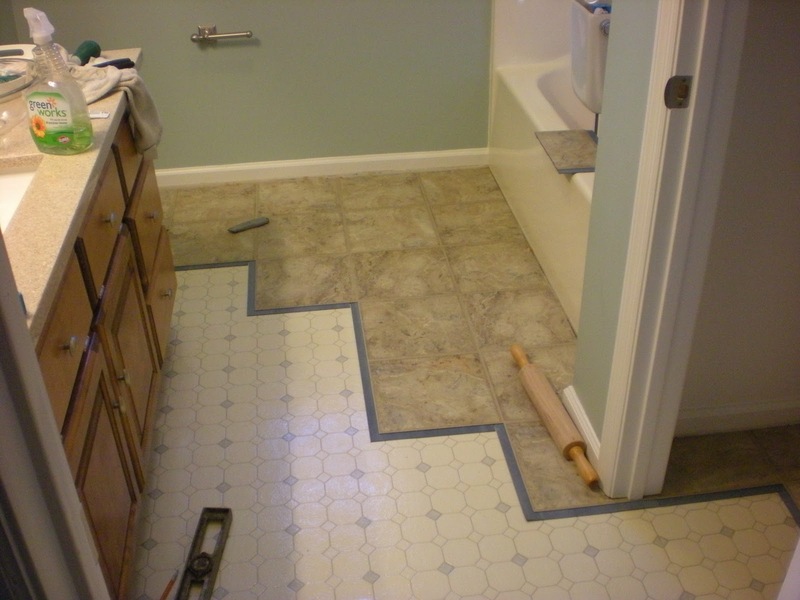 it took to remove the linoleum first. They glue that sh*t down! I never, ever want to repeat that process!! After the floor was finished, there was just the simple task of patching holes, leveling the walls with spackle and sanding (FYI- never put layer after layer of paint around a light fixture/mirror- it leaves a giant ridge), replacing the counter top (can’t have pretty walls with out a pretty counter! 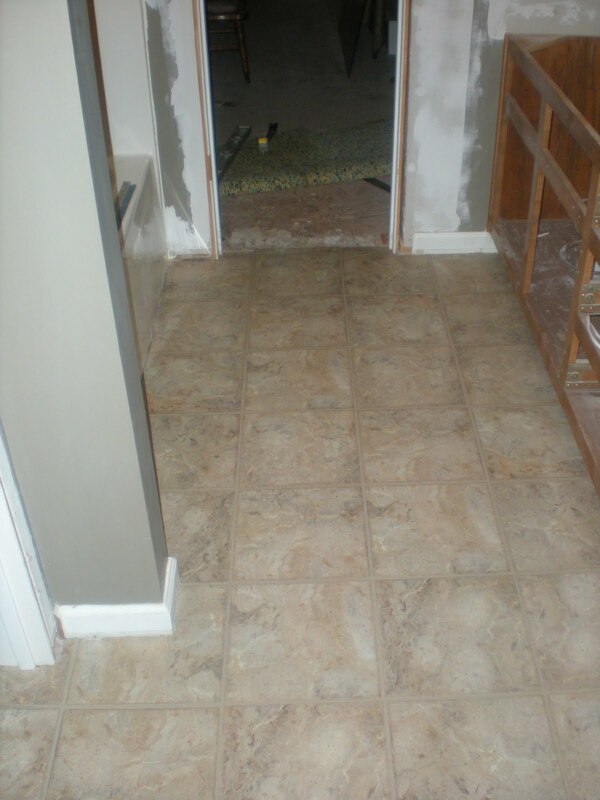 ), oh yeah and laying a new floor! 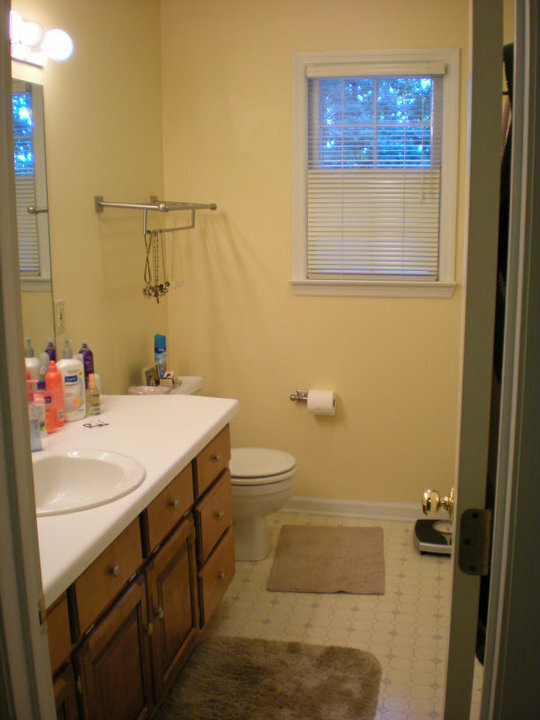 Did I mention that my in-laws would be visiting within the month and that this was our only bathroom downstairs?? Nothing like a little pressure to get you moving. Not too bad for vinyl!! The counter top was ordered from Home Depot (seriously, they love us there!) and is a solid surface coating over cultured marble (special order, made by St Paul, color is ginger). 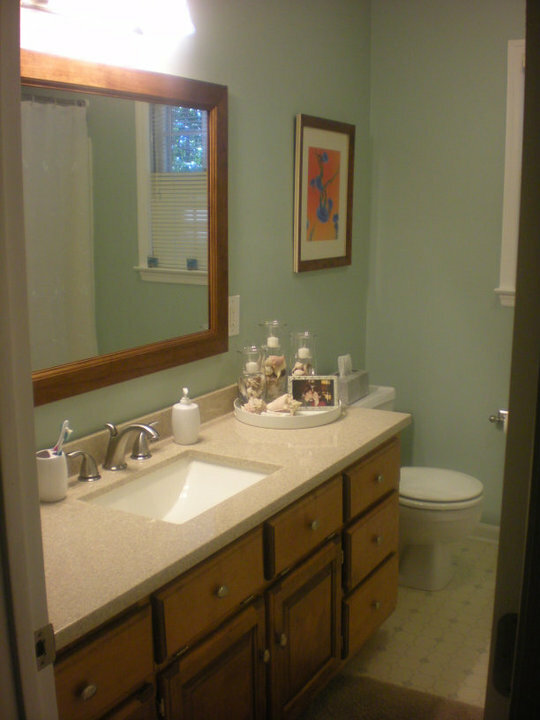 We chose a rectangular, undermount sink. LOVE (all sinks should be undermount, IMHO). The faucet isn’t pictured, but it’s this one by Glacier Bay. The light fixture is similar to this one (the sides are square though, not rounded like the one in the picture)- I was limited by what I could choose for the new light fixture because the hole for the electrical was a large square, not a small circle. Boo. 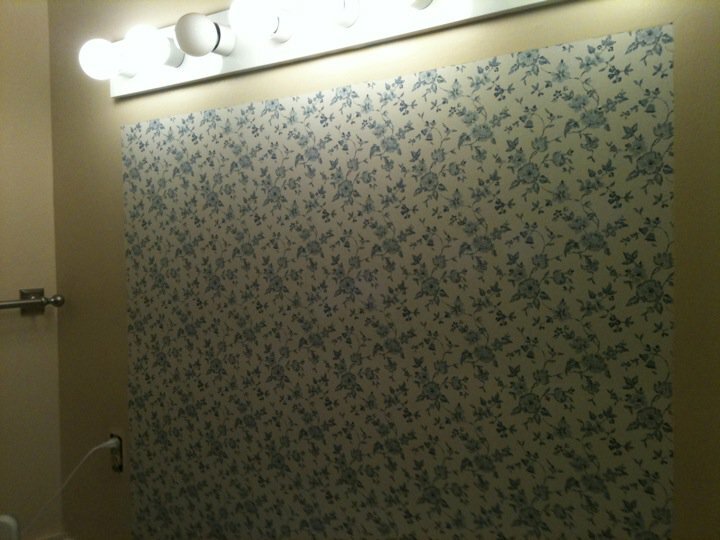 We also had the mirror cut down, because it was mounted with plastic flowers that were 4″ inset from the edge of the mirror- gag. Plus it was GIANT. 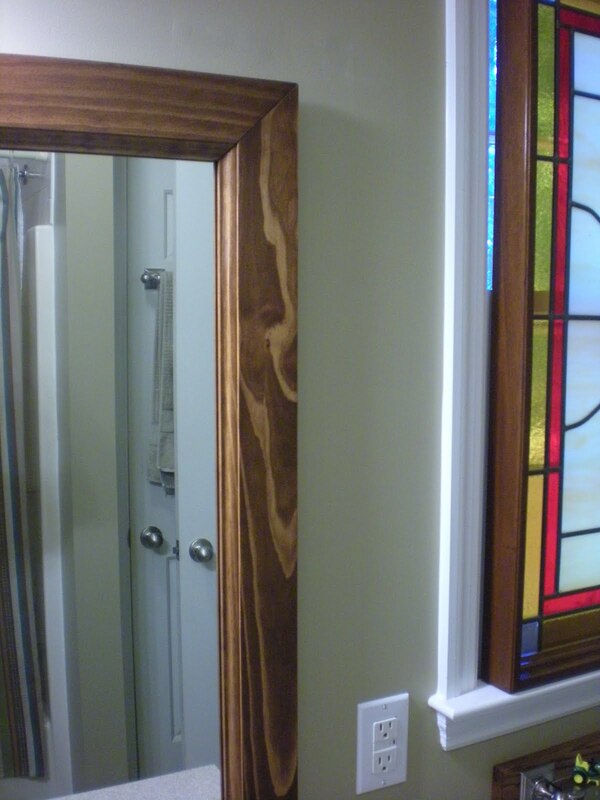 After re-mounting it with thin silver mirror hooks, my husband framed it out with pieces of stained pine molding. Unfortunately I don’t have a picture of the frame- that was done long after my in-laws visit (Note to self- take updated pics!). Phew. 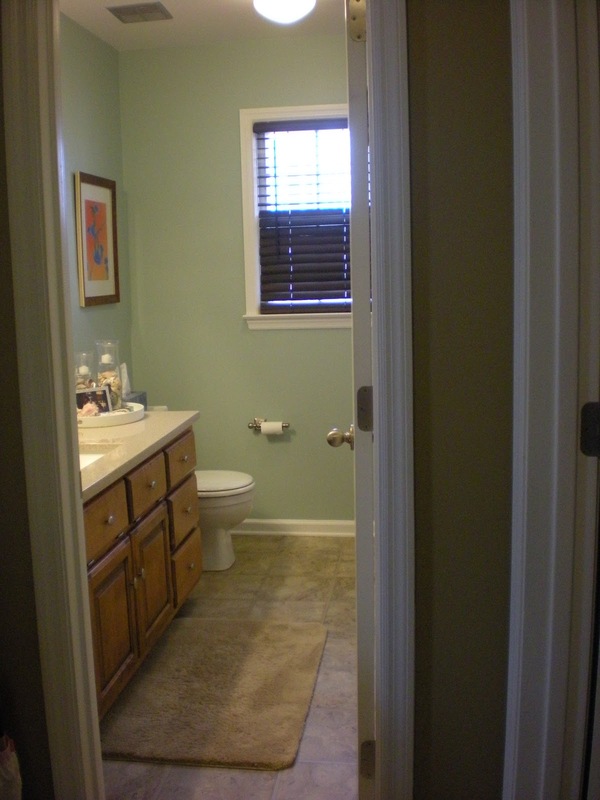 That bathroom was a lot more work than we’d expected it to be- but it looks so nice now. Well worth the effort. What do you think? 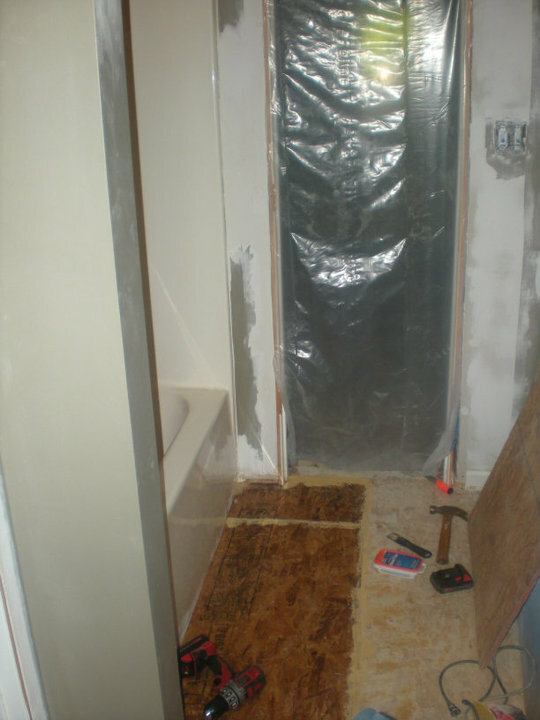 Have you ever found a surprise while doing a simple project at your house? **Disclosure: I was not paid or compensated in anyway by this company for this post.